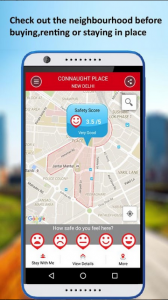 Like the name suggests, Safetipin offers users safety-related information based on location. 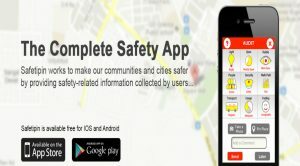 By permitting the app to run in the background, users get alerts with the ‘safety score’ of areas they enter. They can then decide whether they want friends to track them. Users are also permitted to view alternative routes before selecting the safest one. To calculate the ‘safety score’, users are encouraged to become active participants. They are asked to contribute to the safety-related information by sharing sentiments along predetermined parameters such as lighting, visibility, diversity, crowd, public transport, walk path, security, openness, and feeling. Safetipin seems to be a pertinent app for women. I can understand the peace of mind and sense of security it can offer. However, I see the app as a security blanket, much like the ones we had as children; the “blankey” which we believed kept the “monsters” at bay. But does this security blanket offer protection in reality or only in theory? Source: Screenshots from the Play StoreThe images from the Play Store undoubtedly communicate the ease of use and the functionality of the app. According to J.B. Fogg, “Persuasive technologies can adjust what they do based on user inputs, needs, and situations.”  And Safetipin does just that through user participation. 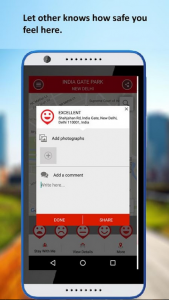 The app persuades users to share their opinions of places in real time, to ensure app information is up-to-date. Crowd sourced data, i.e., data from a collective inspires confidence and assures users that they have access to apt information- based on data aggregated from people just like them. Hence, an overview of the app has the power to persuade users to install it. But is Safetipin using user observations to solely update safety-related information? Upon reviewing the app on the Play Store, it certainly feels like Safetipin is that security blanket. 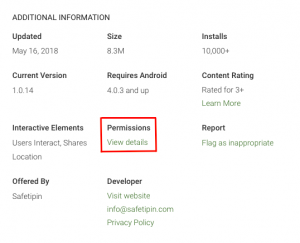 Evidently, Safetipin is not merely interested in providing ‘safety-related information.’ They want to know everything they can know about their users. Making Safetipin a security blanket in theory. And this brings us to ask why? Safetipin possesses the ability to track “social action” along with “online quantified data” in real-time. This allows for predictive analysis, making the aggregated metadata accurate and current. It is no surprise “platform owners routinely share users’ aggregated metadata with third parties for the purpose of customized marketing in exchange for free services.” (Van Dijk, 2014)  While, Safetipin endeavors to keep users safe, the app remains a business with economic motives. As Safetipin encourages its users to tag with geographic information, users are placing information into ready categories. “Categorization is a powerful semantic and political intervention: what the categories are, what belongs in a category, and who decides how to implement these categories in practice, are all-powerful assertions about how things are supposed to be.” says Bowker and Star. Users, however, are not privy to this information. What are the ethical dilemmas which arise from data tracking? The discourse around data tracking and ethics is arguably subjective. Hence, the line between ethical and unethical is blurry. Users consider lack of information unethical. This includes not knowing what data is being collected, who is collecting data and how data is used. But, business owners can argue that the users consented when agreeing to the terms & conditions prior to installing the app. History is filled with examples and if we look at the present I am sure we will find many more. “Marc Rotenberg of the Electronic Privacy Information Centre noted that misuse and abuse of data are not a new problem.”  Yet, there seems to be little movement where action is required. I too believe that we need a “New Deal on Data”- the power to choose how our data is going to be used, and who is going to be using it. Data misuse could be prevented by giving data a lifespan. This perspective could spark debate and possibly arrive at a solution so that we are safe in the truest sense. « Article 13: The End of Internet Freedom . . . and Memes?